Thanks so much for all of your helpful comments about kids' books last week! If you have a voracious reader and missed that post, please go check out the comments. Great ideas! So, so true. 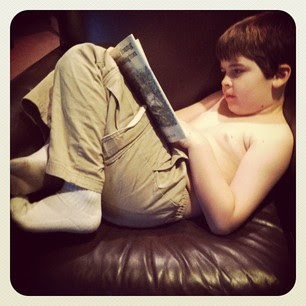 Nathaniel wedges himself into a chair to read, tossing and turning, but rarely sitting with his feet on the floor. I'm the same way. I truly feel that children who are avid readers will have an edge on all the others. I find that I watch less and less TV and am reading more and more. Of course, the quality of TV is so low that it is evident that most TV producers are not readers. Hail the Readers in the World! 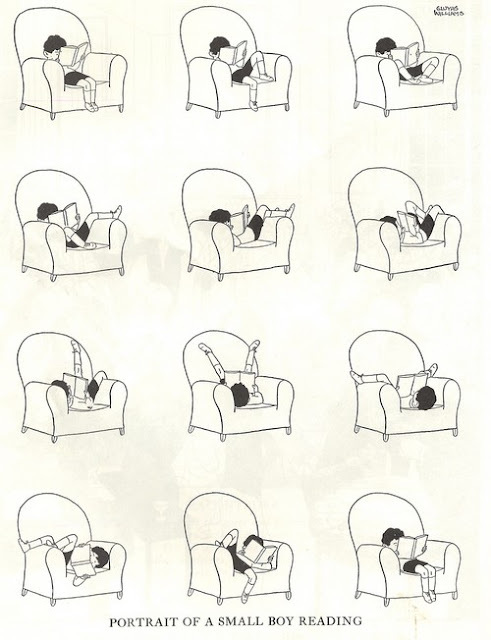 There's a reason for the phrase, "curl up with a good book." It's 'cause it's awesome.